Quentin Ronald Mease. Courtesy of the National YMCA Hall of Fame. Image available on the Internet and included in accordance with Title 17 U.S.C. Section 107. MEASE, QUENTIN RONALD (1908–2009). Quentin Ronald “Quent” Mease, one of Houston’s most influential African-American community leaders during the mid-to-late twentieth century, was born on October 25, 1908, in the now abandoned mining town of Buxton, Iowa. He was the youngest of five children born to Charles Henry Mease and Cornelia (Tate) Mease. Quentin Mease was most notably involved in the development of the Third Ward’s South Central YMCA, the Harris County Hospital District, and the relatively peaceful desegregation of Houston businesses. Mease worked behind the scenes, often with prominent white citizens, to help bring about change and progress for both blacks and whites. The contributions that Quentin Mease made will forever place him as a prominent African-American leader and as a pioneer for progress in the Houston area. YMCA Logo. Courtesy of the YMCA. Image available on the Internet and included in accordance with Title 17 U.S.C. Section 107. The desire to be involved in community work began early for a young Quentin Mease. His father was not just a coal miner, but a union organizer, a justice of the peace, and a leader in the church and local YMCA. While still very young, Mease attended YMCA meetings where his father was chairman of the board. Sitting in on the meetings provided a glimpse into the everyday decisions that went into running an organization and community. He patronized the YMCA in Buxton often to participate in some of the town’s only available entertainment. These early experiences with the YMCA influenced Mease to continue involvement with the organization and seek a career with it. After his father’s death in 1918, his mother Cornelia, a seamstress, moved the family to Des Moines. 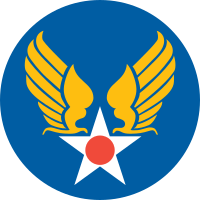 United States Army Air Forces Shoulder Sleeve Insignia. Image available on the Internet and included in accordance with Title 17 U.S.C. Section 107. Following graduation from Des Moines’s West High School in 1924, Mease attended college at Des Moines University, a now defunct Baptist institution, where he earned a liberal arts degree in 1928. While in college, he took up the positions of executive secretary and physical director of the Crocker Street YMCA and served as secretary of the NAACP branch in Des Moines. On August 28, 1942, Mease was drafted into the United States Army Air Forces. With an already impressive resume and a hard work ethic, Mease quickly impressed his superiors and became a captain in the Army Air Forces Quartermasters Corps. Mease did a tour of the Pacific Theater during the war and was released from active service in June 1946. He remained in the reserves, and eventually attained the rank of major. The Houston Texans YMCA, completed in 2011, replaced the 1955 South Central Y. Courtesy of John Lindy and Fretz Construction. Image available on the Internet and included in accordance with Title 17 U.S.C. Section 107. Map of the Houston Texans YMCA in the Third Ward. Image available on the Internet and included in accordance with Title 17 U.S.C. Section 107. Houston Area Urban League Building. Courtesy of Houston Style Magazine. Image available on the Internet and included in accordance with Title 17 U.S.C. Section 107. Mease served as executive secretary of the South Central YMCA for more than two decades. 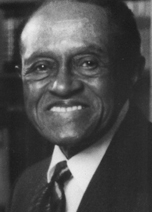 During his tenure, he helped found the Eliza Johnson Home for the Aged, the Houston Council on Human Relations, the Houston Business and Professional Men’s Club, and the YMCA Black Achievers Program, which in the early twenty-first century was a nationwide program known as the YMCA Minority Achievers Program. He also helped create the Houston chapter of the Urban League in 1968 and served as the first board president. Prior to that, Houston was the largest city in the country without an Urban League chapter. In 1950 Mease married Jewell Chenault of San Antonio. Together they raised one daughter, Barbara (Mease) Ransom. Jewell passed away in 1978. 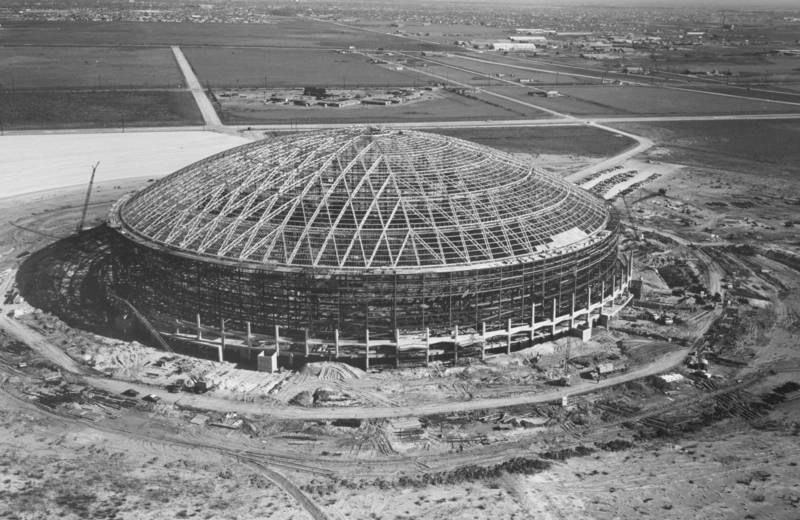 Astrodome Construction, 1962. Image available on the Internet and included in accordance with Title 17 U.S.C. Section 107. The desegregation of Houston’s public spaces is also an area that Mease was able to wield his influence. When plans to bring a professional baseball team to Houston arose in the late 1950s, a bond issue needed to be voted on for the construction of a new stadium. In 1958 Mease was contacted by city officials to garner support for the bond in the African-American community. Mease let it be known, however, that he would not engage in trying to gain support for the bond if the new domed stadium, the Astrodome, was operated on a segregated basis. Mease and other black leaders petitioned the National League expansion committee that assured them the franchise would only be approved if the stadium operation on a nonsegregated basis. With that assurance, support did come from the black community, and the stadium was completed in November 1964. 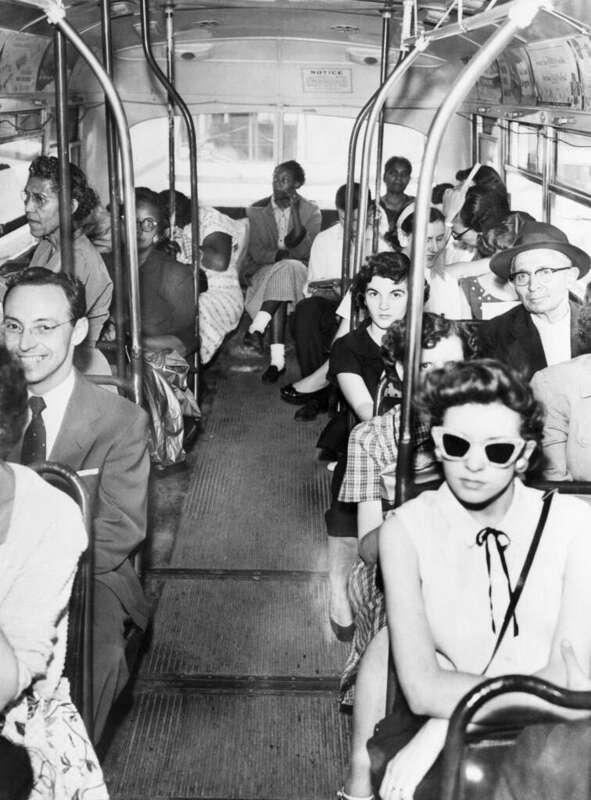 Despite desegregation on buses, whites and blacks still separated themselves. Courtesy of the Houston Chronicle. Image available on the Internet and included in accordance with Title 17 U.S.C. Section 107. Quentin Mease Community Hospital, named after Mease for his service to the Hospital District sytem, circa 1983. Courtesy of Houston History Magazine. Image available on the Internet and included in accordance with Title 17 U.S.C. Section 107. The Astrodome was not the only public space that Mease was involved in desegregating; he had a role to play in the student sit-in movement as well. Student sit-ins were beginning in other cities around the country, and Mease wondered why that was not happening in Houston. He said as much to Texas Southern University student and South Central YMCA employee Eldrewey Stearns and encouraged him to organize students. Stearns organized a group of students at TSU and formed the Progressive Youth Association, which used the YMCA as a planning and staging area for their demonstrations. While the students began their protests, Mease and other black leaders coordinated a series of secret, unpublicized meetings with some of Houston’s most prominent white businessmen. Their goal was to find a peaceful avenue toward desegregation that would avoid the violence associated with protests in other parts of the country. In the process, they received the support of a number of influential white Houstonians, including Bob Dundas, Roy Hofheinz, and John T. Jones, Jr., who helped persuade white business owners to open their doors to black patrons. 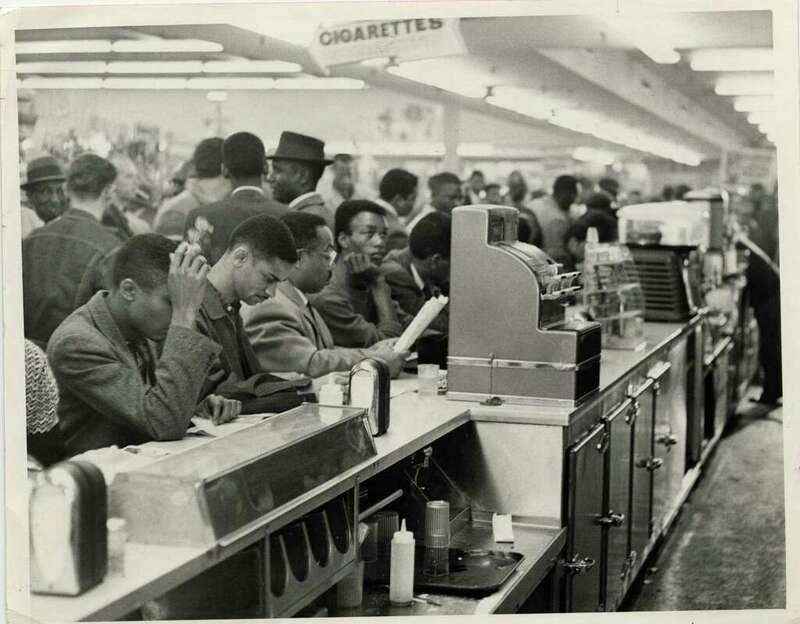 In a manner very special to the history of Houston, the city’s restaurants, theaters, hotels, and other retail spaces were desegregated quietly, without significant violence or publicity. Another major contribution Mease made to the city of Houston was the role he played in the creation of the Harris County Hospital District (now known as Harris Health System). Prior to the creation of the district in 1965 there were two public hospitals—Jefferson Davis and Ben Taub. The two facilities were poorly funded, staffed, and administered. With a growing population these problems were affecting a larger number of people. Quentin Mease was a part of the referendum effort to ensure that a hospital district was created so that these concerns could be reviewed and resolved. After the hospital district was created, Mease was appointed to the hospital district board of managers, and he served as board chair from 1971 to 1990. The board was confronted with myriad problems including funding, staffing, and even accreditation, due to the way the hospitals were constructed. However, as board chair, Mease oversaw one of the largest building and renovation campaigns in the history of United States healthcare. The city’s dilapidated hospitals were refurbished, numerous community health clinics were constructed, the aging Jefferson Davis Hospital was replaced by Lyndon B. Johnson Hospital, and the Texas Medical Center was greatly expanded. Mease also served as chairman of the Harris County Hospital District Foundation and was an emeritus board member of the Texas Medical Center and Baylor College of Medicine. Mease officially retired in October 1990. He contracted pneumonia and died on February 24, 2009. Shortly before his death, he was honored by the NAACP at the organization’s 100th anniversary celebration in Houston. His funeral was held at Antioch Missionary Baptist Church, and he was buried in Houston National Cemetery. Quentin R. Mease Community Hospital in Houston is named in his honor. Thomas R. Cole, NO Color Is MY Kind: The Life of Eldrewey Stearns and the Integration of Houston (Austin: University of Texas Press, 1997). Henry Louis Gates, Jr., and Evelyn Brooks Higginbotham, eds., African American National Biography (New York: Oxford University Press, 2008).Houston Chronicle, October 5, 2006; February 12, 25, 27, 2009; March 7. 2009. Quentin R. Mease, On Equal Footing, a Memoir (Austin: Eakin Press, 2001). Handbook of Texas Online, Julian Dunn and R. Matt Abigail, "MEASE, QUENTIN RONALD ," accessed April 18, 2019, http://www.tshaonline.org/handbook/online/articles/fme86. Uploaded on August 13, 2013. Modified on May 23, 2017. Published by the Texas State Historical Association.